Caption slip reads: "Photographer: Miller. Date: 1957-04-20. Reporter: Adler. Assignment: Arcadia Easter egg hunt. David Tapparo, 2, hunting eggs in brush of Arcadia County Park. 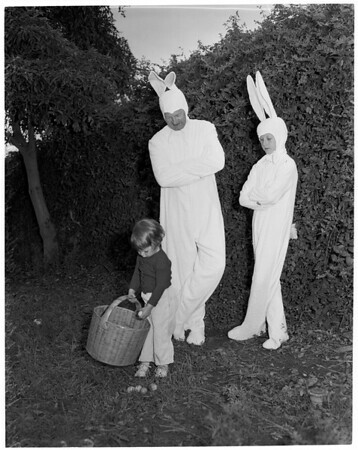 Easter Bunnies William L. Peddington, Arcadia juvenile officer & his son, Dennis Reddington, 10, watch while Kathy Shipman, 2, hunts eggs with big basket. Youngsters being let loose for egg hunt".